This resource contains a fully editable and interactive PowerPoint quiz on Thanksgiving Day. On what day is Thanksgiving Day in the United States of America? Which King in England tried to make everyone follow the Church of England religion? What was the name given to people who would not follow James I demands to follow the Church of England religion? 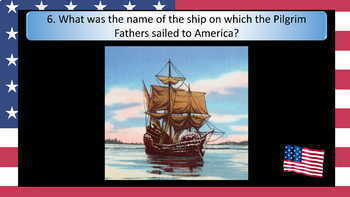 What was the name of the ship on which the Pilgrim Fathers sailed to America? Which President proclaimed the first national Thanksgiving Day? In what year was Thanksgiving Day made a national holiday for the whole of the United States? 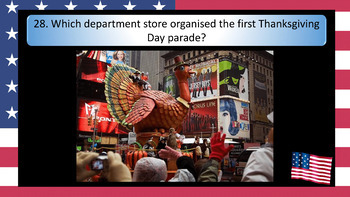 Which department store organised the first Thanksgiving Day parade? You may also be interested in the Thanksgiving Day presentation that accompanies this quiz and contains all the answers. This resource contains a fully editable and informative PowerPoint presentation on Thanksgiving Day. The PowerPoint contains hyperlinks to the Thanksgiving Parade in New York, President Obama's final 'turkey pardoning' and a short video on the history of Thanksgiving Day. A simple text version of this presentation, more appropriate for younger / Special Education students, is also available. Save money and buy both resources together at a discounted rate. This resource contains a set of 6 differentiated word searches and anagrams.